This description covers the use of the 'Model Patterns' tab. See the Learn more list for links to information on the other two tabs. Displays the name of the Package you have selected in the Project Browser. If you are using the Model Wizard by default on a newly-opened project, this field shows the Model root, 'Model'. If you need to change the Package to generate the model under, click on the icon and browse for the correct Package on the 'Navigator' browser. A Pattern can contain several Packages; select this checkbox to indicate that you will import only some of these Packages from the Pattern into your model. After you click on the OK button, the 'Select Packages' dialog displays on which you specify which of the Packages to import. If you select more than one Pattern, the 'Select Packages' dialog displays for each Pattern in turn. If you do not select the checkbox, all Packages in each Pattern will be imported into the model. You can also use the Model Wizard to create these MDG Technologies, by selecting the Framework technology and the MDG Technology Builder patterns. These create a Model Package containing templates that you can use to generate the technology and a set of Profiles. 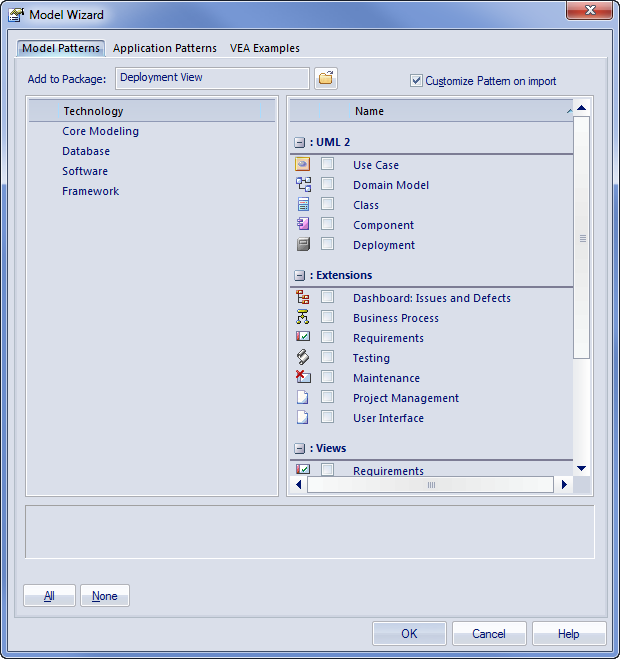 Click on the required technology to list the associated Model Patterns in the 'Name' panel. Click on this button to select all of the Model Patterns listed in the 'Name' panel. Click on this button to clear all Model Patterns selected in the 'Name' panel.